Now THAT’S something I’ve never seen before! 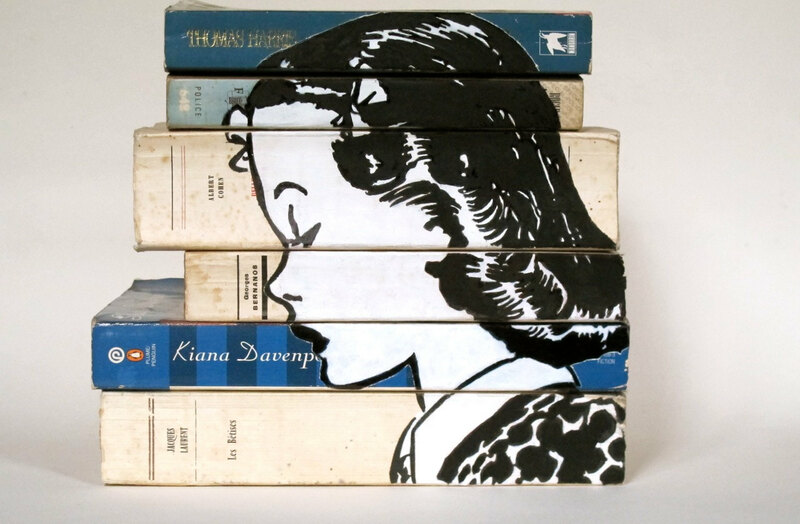 New trend for re-using OLD books. 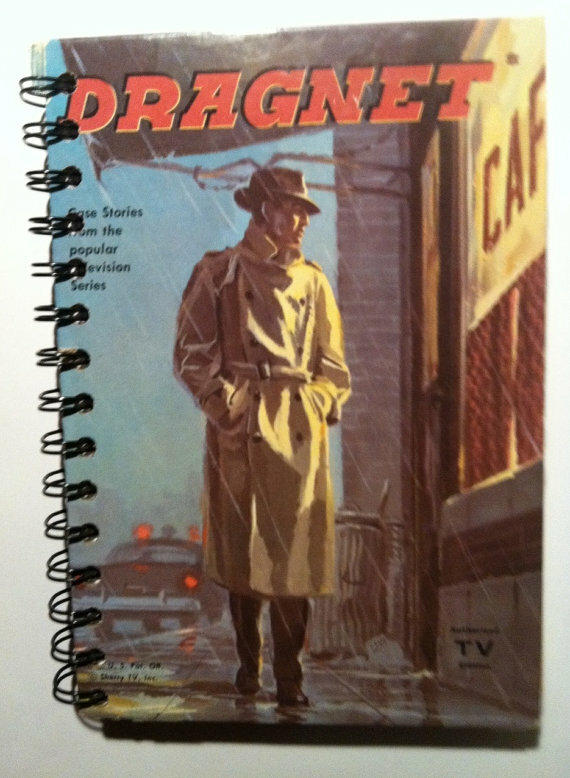 I sill get a few of the wholesale product catalogs that we ordered from back when we had our own store. Still enjoy looking at them for clues on trends, and yes, IDEAS for creations. And I almost always come across several items that I was hand crafting YEARS ago, that they are now mass producing and selling wholesale. That is just the nature of the industry! 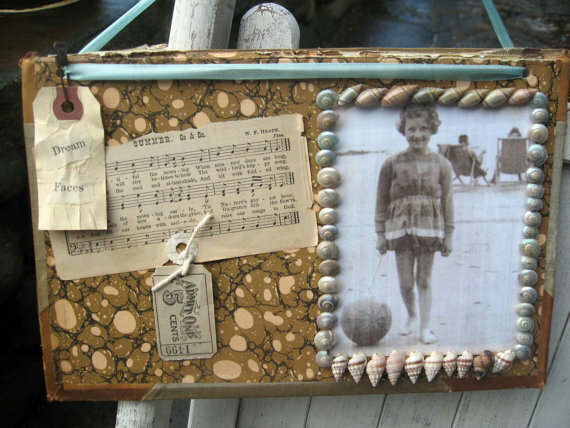 She only had these two such creations in her etsy shop; and mostly sold beautifully coordinated paper and ephemera sets and unique collage books. sets. So it will be interesting to see if this idea ‘takes off’. Or even if SHE makes more of them. I looked at her list of previously sold items to see if she had made more that had sold, and did not see any there either. So it appears that this is a NEW thing. 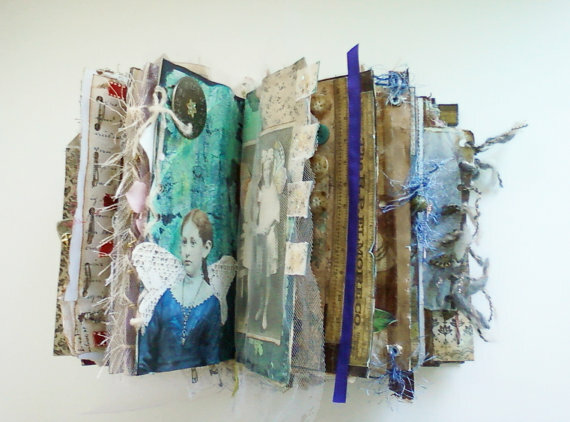 I’ve seen the COVERS of old books painted up in different decorating themes to match specific decors or seasons. 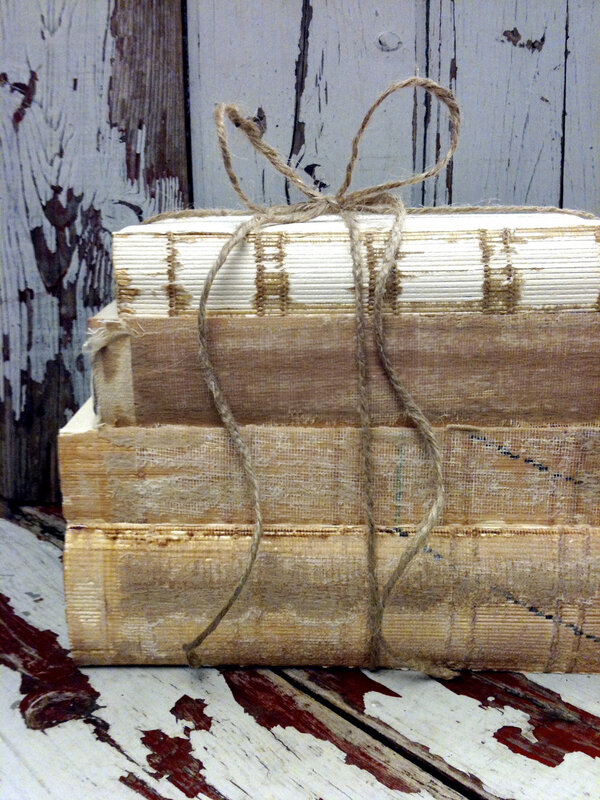 Have seen all the books on a shelf covered in pretty paper or fabric too. I make and sell bundles like this in my booth at Stars, and have a FEW in my etsy shop. 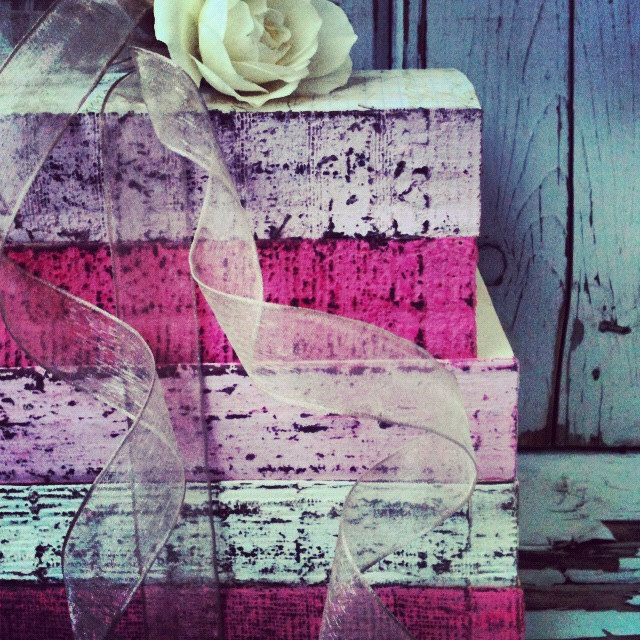 SOME etsy shops sell HEAPS of them! As far as I know, this trend was launched by Pottery Barn. 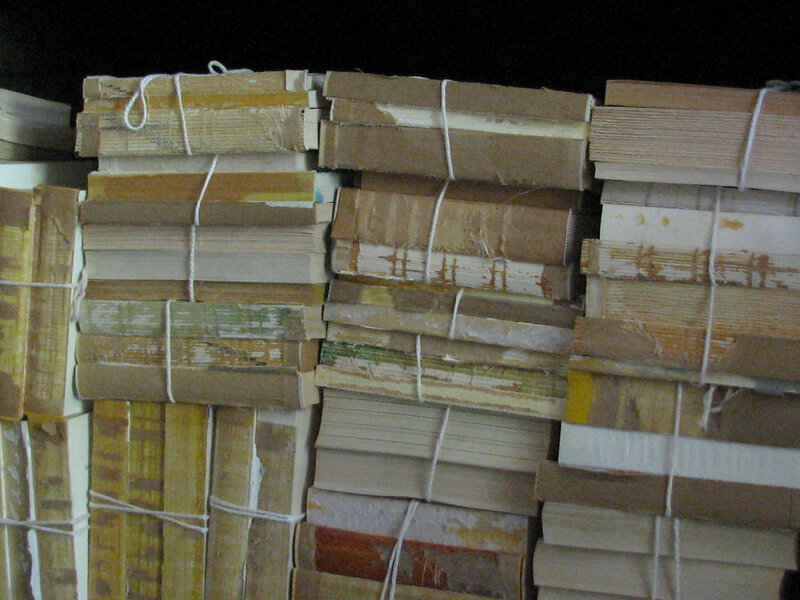 They sell s bundle of PAPER BACKS, with covers removed, for around $30.00! I think shoppers LOVED the look and figured they could do it themselves a lot cheaper! 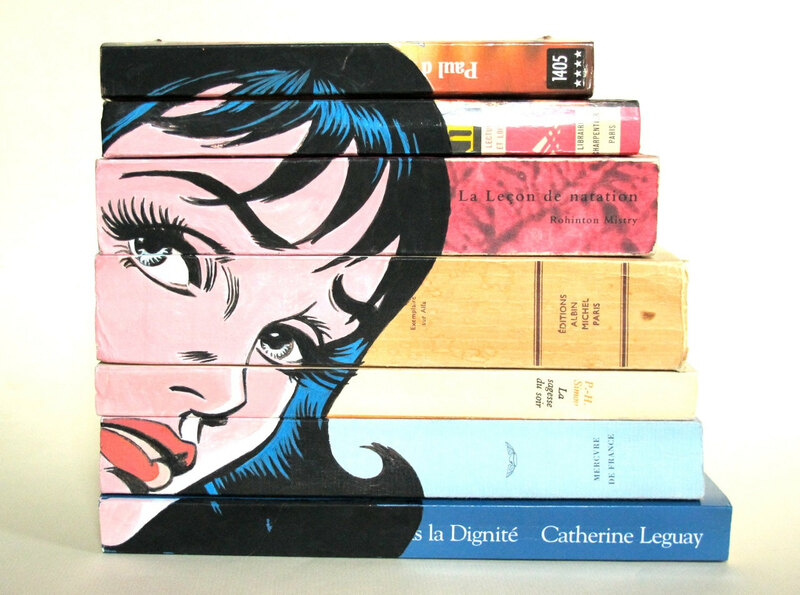 I’ve also seen old books painted up like this, in coordinated color schemes. 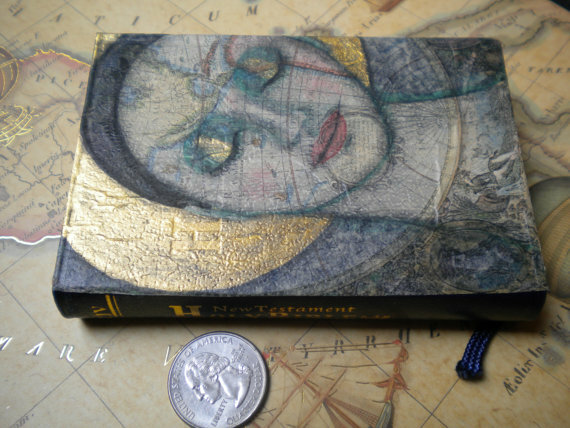 And painting ON the book cover. I even saw a book cover painted with CHALKBOARD paint. And get this, (this is EXACTLY what I was talking about in the intro!) the vendor claims that this is her own original idea, and you must ask her permission before replicating the idea to sell for profit. It’s both funny and SAD the misconceptions that some people have regarding what can and cannot be protected by copyright. Chalkboard paint is CRAZY popular right now and I’d almost be willing to BET that a hundred other crafters came up with the same idea at the same time! I mean, that’s like me saying I started the bechy blue color trend, and that you need my permission to paint your own items this same color. Just shaking my head . . . .
And some other clever people re-use the book COVERS to make covers for journals. And add unique design elements to the insides. 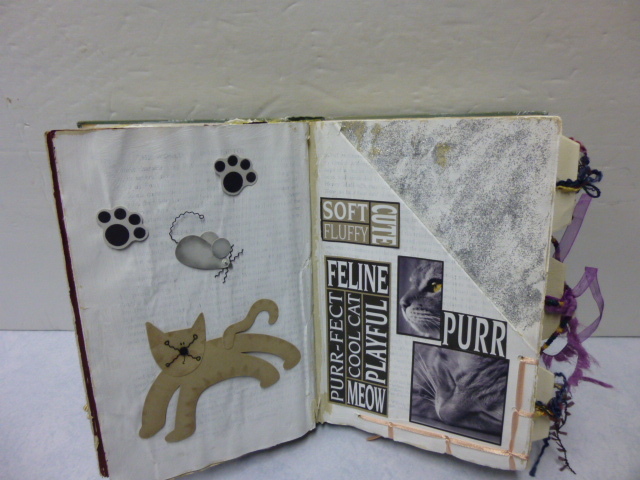 My ‘bestie’ Beth made an awesome book for me out of an old book that was something like the one above. Only mine had a CAT theme. 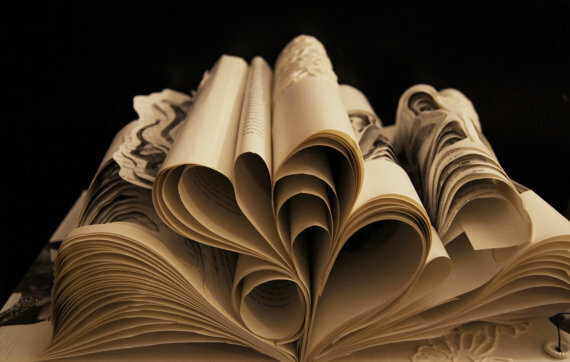 Each and every PAGE is a work of art on its own! 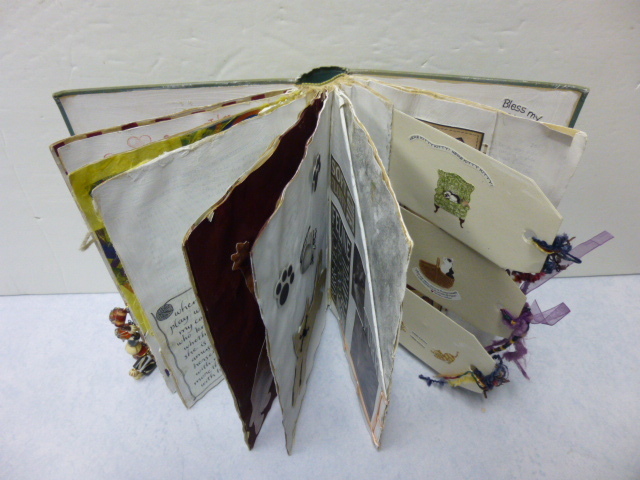 She removed some of the pages, then glued several together for each ‘page’ that she left, so they are really sturdy! 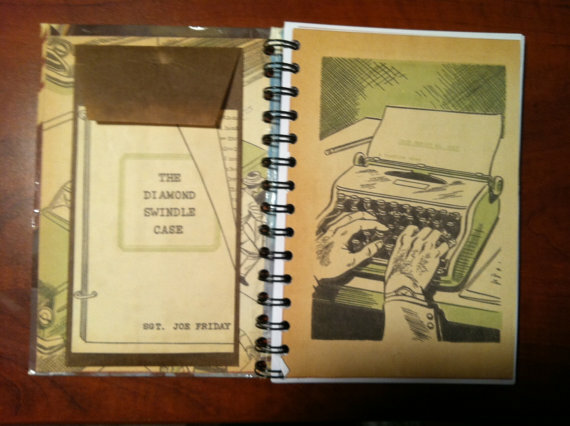 Folded pages to create pockets for stashing memorabilia. 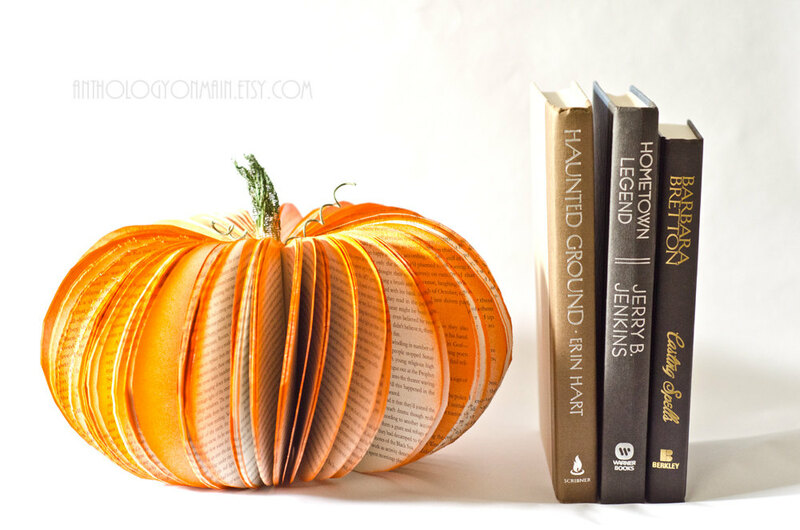 Here’s another clever re-use for a book cover! Make it into a purse! 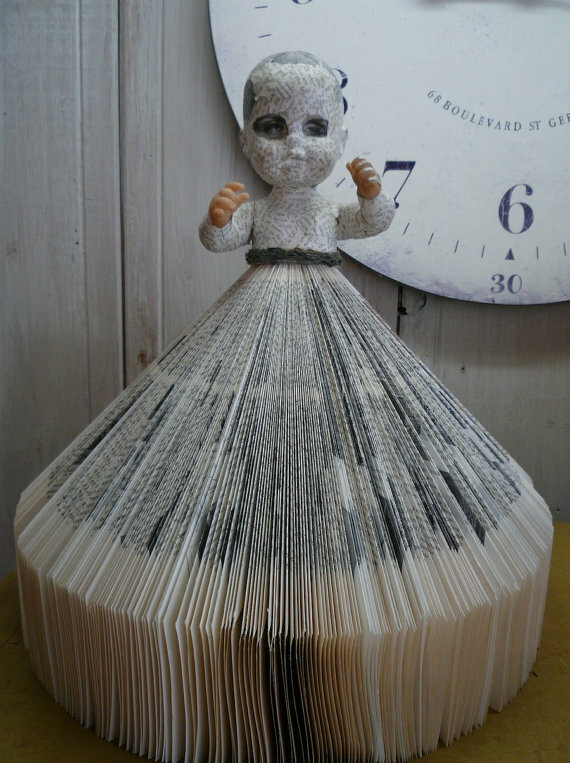 THESE book sculptures are absolutely AMAZING, aren’t they? This is pretty amazing too! I’m pretty sure I’ve shown this idea before. I MUST make myself one to keep on my paper craft desk to store all those little scraps of leftover paper that I can’t BEAR to throw away, but can never find when I have a use for them! 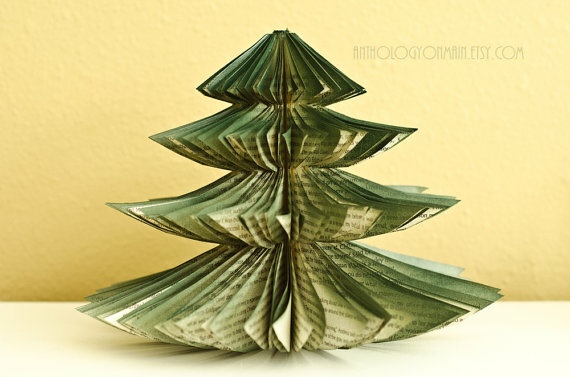 Do you remember folding old Reader’s Digest magazines and making Christmas trees and Angels out of them??? Our mom used to make us sit and fold them for HOURS for her! Here’s an updated ‘Goth’ version of the aforementioned angels! YIKES!! I remember mom using a styrofoam egg for the head, and covering it with old PANTYHOSE to make it flesh colored! Beads for the eyes and nose and real angel hair for the hair, and a pipe cleaner halo! Oh how I HATED having to help her make those things!!! And she made Christmas trees. One size only, and a secondary fold at the bottom to create a bit of a base. Decorated with individually glued on sequins and tiny beads! 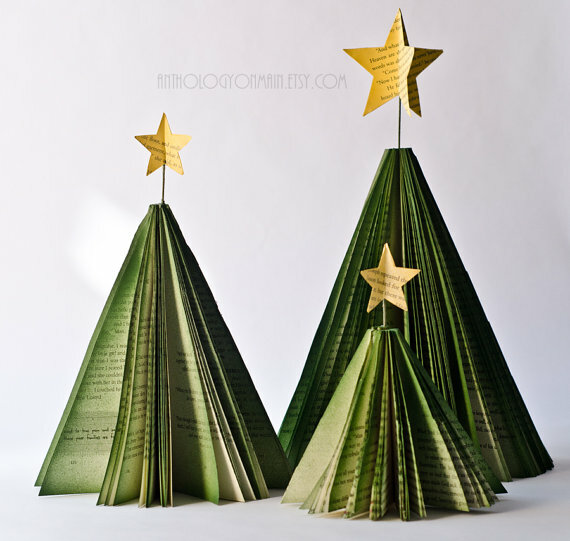 Here’s a recent version of a book page Christmas tree. 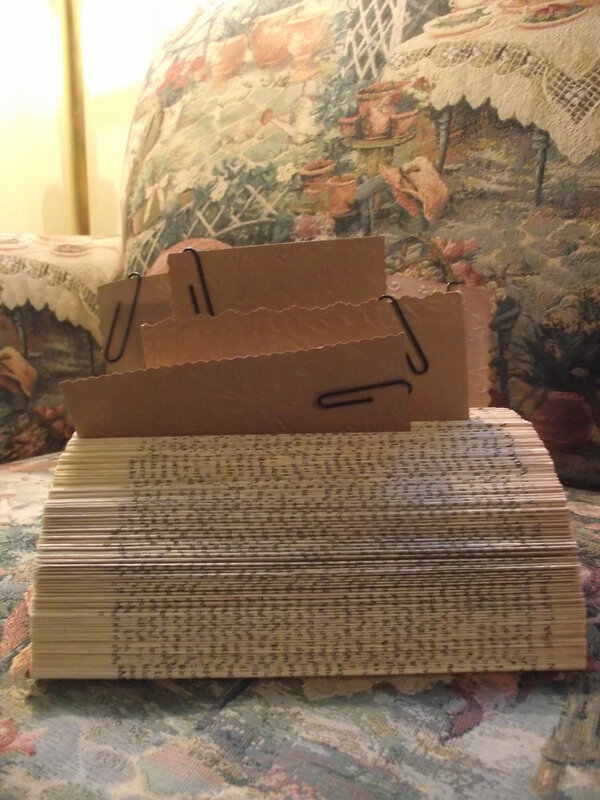 I do NOT have the patience that it would require to CUT all those pages! 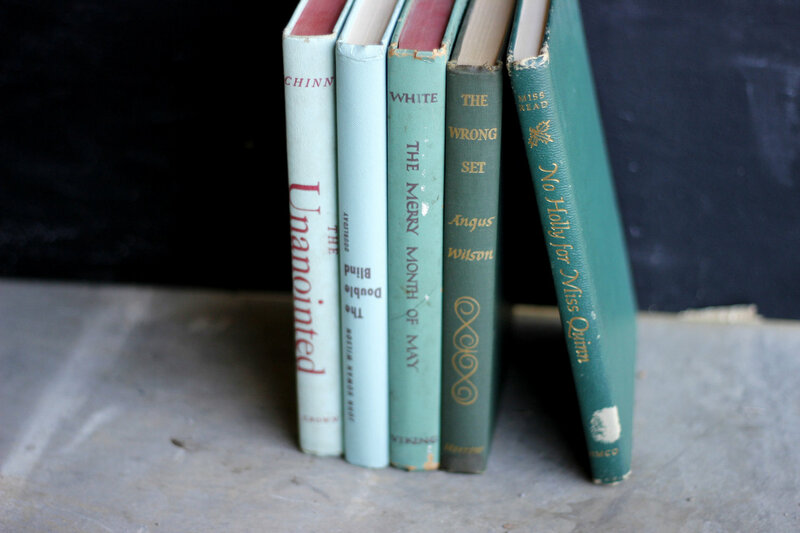 And if all that isn’t enough to get you heading out to the next rummage or garage sale to hunt for old books to craft with, there are lots more ideas in my blog for things to do with just the ‘book pages’! That’ll have to be another post. 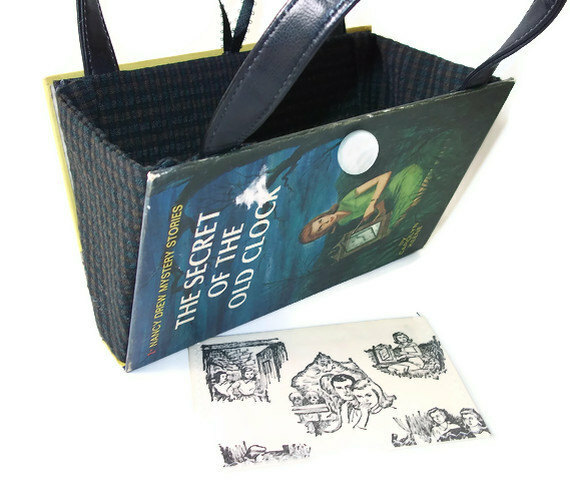 Are there any other old book ideas out there that YOU have seen? I really think all of the book ideas are fantastic. Thanks for posting such interesting reads and examples. Got me stirred up to start paper crafting! I have some old dictionaries I want to craft with. I am REALLY enjoying your blog. On a recent field trip to the Oakland Museum with my son’s class to see the Dia de los Muertos exhibit I saw a small house made entirely out of painted hard cover books. I would be happy to send you some pics if you would like. The “alter” as it was intended was quite beautiful. 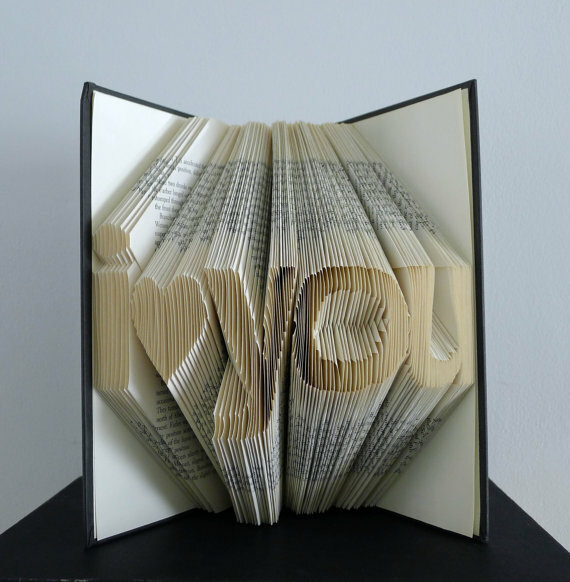 Thanks for your beautiful blog, I found you via Pinterest. Kitty, I would LOVE to see the pictures! If they are posted on your Pinterest page, you can just send me the link. You’ve brought back fun memories with the folded-page Christmas trees and angels, though the Goth one creeps me out a bit! I remember making them one year.